Masonry contractors are usually directed to install flashing with their masonry product. Flashing acts as a barrier which redirects moisture away from building interiors and back toward the exterior of the wall. Common flashing materials include synthetic membranes (peel and stick) and metals, such as copper and stainless steel. 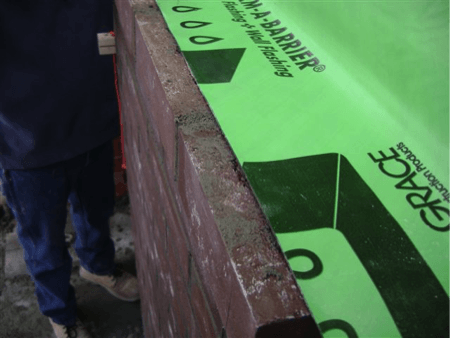 The material that is used will directly affect the expected lifespan of the flashing, especially where flashings are exposed to sunlight or weathering. Holding flashing back from the wall face can result in entry points for moisture to penetrate the wall. Masonry cavity drainage testing in progress. Brick: Brick Industry Association (BIA) Technical Notes on Brick Construction No. 7: Water Penetration Resistance – Design and Detailing. CMU: National Concrete Masonry Association (NCMA) TEK 19-5A: Flashing Details for Concrete Masonry Walls. Adhered Manufactured Stone Veneer: Masonry Veneer Manufacturer’s Association (MVMA) Installation Guide and Detailing Options for Compliance with ASTM C1780.